Cinnamon can be used as flavoring agent in the manufacture of whiskey, vodka and brandy. Cinnamon is the aromatic, inner bark of certain bushy, tropical, evergreen trees of the Cinnamomum genus. Cinnamon is used in traditional medicine to facilitate digestion and reduce flatulence, to reduce high blood sugar level and as local anesthetic. It also shows powerful anti-viral effects. It is native to Sri Lanka, the neighbouring Malabar Coast of India, and Myanmar (Burma). Cinnamon has been in use by humans for thousands of years—as early as 2,000 B.C. Egyptians employed it, as well as the related spice cassia, as a perfuming agent during the embalming process. Evidence suggests it was used throughout the ancient world, and that Arab traders brought it to Europe, where it proved equally popular. Cinnamon tree lives from 30 to 40 years in the wild. Cinnamon can be used in preparation of numerous sweet and salty dishes and drinks (such as coffee and tea). Legend holds that the Roman emperor Nero burned as much as he could find of the precious spice on the funeral pyre of his second wife Poppaea Sabina in A.D. 65 to atone for his role in her death. In the first century A.D., Pliny the Elder wrote off 350 grams of cinnamon as being equal in value to over five kilograms of silver, about fifteen times the value of silver per weight. Through the Middle Ages, the source of cinnamon remained a mystery to the Western world. Cinnamon is a small evergreen tree 10-15 meters (32.8-49.2 feet) tall. Cinnamon is more than just a popular spice with pleasant taste. It contains important minerals such as iron, potassium, zinc, calcium and magnesium. Cinnamon sticks also contain vitamin A and vitamins of the B group. The leaves are ovate-oblong in shape, 7-18 centimeters (2.75-7.1 inches) long. Dark purple fruit of cinnamon tree is called drupe. It is 0.5 inches long and ellipsoid in shape. Fruit contains one seed. Cinnamaldehyde is a substance isolated from the bark of cinnamon tree that prevents clotting of the blood. It can prevent stroke and arterial diseases. The flowers, which are arranged in panicles, have a greenish color, and have a rather disagreeable odor. Flowers are small and green in color. They are grouped in terminal panicles. The fruit is a purple one-centimeter berry containing a single seed. Cinnamon was used in ancient Egypt for the process of mummification and as an ingredient of perfumes. Leaves are green and oval in shape. They are usually 2 to 7 inches long and oppositely arranged on the branches. Leaves are fragrant due to high content of aromatic oils. When harvesting the spice, the bark and leaves are the primary parts of the plant used. It is principally employed in cookery as a condiment and flavouring material. Cinnamon is often used in savoury dishes of chicken and lamb. In the United States, cinnamon and sugar are often used to flavour cereals, bread-based dishes, such as toast, and fruits, especially apples; a cinnamon-sugar mixture is sold separately for such purposes. Ground cinnamon is composed of around 11% water, 81% carbohydrates, 4% protein, and 1% fat. Bark of cinnamon tree is smooth, pinkish-brown in color. It contains numerous compounds and oils that are responsible for the pleasant odor and hot, strong taste. Cinnamon used in human diet is actually inner bark of cinnamon tree. Cinnamon has a long history of use in traditional medicine. 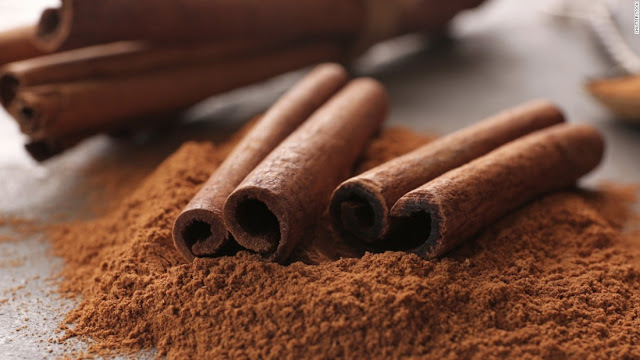 The health benefits of cinnamon include its ability to help manage diabetes, protect against fungal and bacterial infections, increase brain function, prevent certain cognitive disorders, improve digestion, boost the strength of the immune system. Cinnamon is a rich source of vitamin K, calcium, and iron, while providing moderate amounts of vitamin B6, vitamin E, magnesium, and zinc. Cinnamon constituents include some 80 aromatic compounds, including eugenol found in the oil from leaves or bark of cinnamon trees. Cinnamon can induce allergy in sensitive persons. It also can induce liver and kidney disorders when consumed in high amount due to toxic substance called coumarine. Cinnamon tree is small evergreen plant that can reach 32 to 49 feet in height. Cultivated cinnamon tree is grown in the form of bush. Cinnamon is used in cosmetic industry in the production of numerous lotions and creams. Because of its spicy taste, lipsticks with cinnamon can induce swelling of the lips. This effect (full and bright red lips) does not last long. Cinnamon is a popular flavouring in numerous alcoholic beverages and cocktails. Indonesia and China are world largest producers of cinnamon with 75% of the world’s supply. The term “cinnamon” also is used to describe its mid-brown colour. In Exodus 30:23-4, Moses is ordered to use both sweet cinnamon (Kinnamon) and cassia (qəṣî`â) together with myrrh, sweet calamus (qənê-bosem, literally cane of fragrance), and olive oil to produce a holy oil to anoint the Ark of the Covenant. Cinnamon also is mentioned in Proverbs 7:17-18, where the lover’s bed is perfumed with myrrh, aloe, and cinnamon. Psalm 45:8 mentions the garments of Torah scholars that smell of myrrh, aloes, and cassia. Cinnamon also is alluded to by Herodotus and other classical writers. According to Herodotus, both cinnamon and cassia grow in Arabia, together with incense, myrrh, and ladanum, and are guarded by winged serpents. The phoenix builds its nest from cinnamon and cassia. Cinnamon can be used for the preservation of food because of its antimicrobial properties.